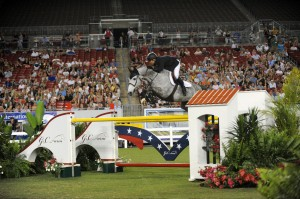 Tampa to Host Stadium Jumping, Inc.’s 2012 Equestrian Series! Hey Sports Fans, Tony here to share some exciting news from the Equestrian world! For two weeks, the world’s top equestrian will gather in Tampa for Stadium Jumping, Inc.’s 2012 Tampa Equestrian Series, set to run from March 28-April 7, 2012. The series will begin with the Tampa Bay Classic CSI, to be held March 28-April 1 at the Bob Thomas Equestrian Center at the Florida State Fairgrounds. The Tournament of Champions CSI will follow, April 3-7, also at the Bob Thomas Equestrian Center. In addition to these events, the FEI World Cup Qualifier CSI 2*-W Grand Prix of Tampa will take place on Sunday, April 1. This will be the final qualifying event for the 2012 World Cup Finals in Hertogenbosch in the Netherlands. The 2012 Equestrian Series will culminate at Raymond James Stadium with the 40th Annual $200,000 Gene Mische American Invitational presented by G&C Farm. The event, one of the premier show jumping events in the U.S., is set for April 7. That&apos;s all for now. Stay tuned for more news on what&apos;s coming up in Tampa Bay Sports!